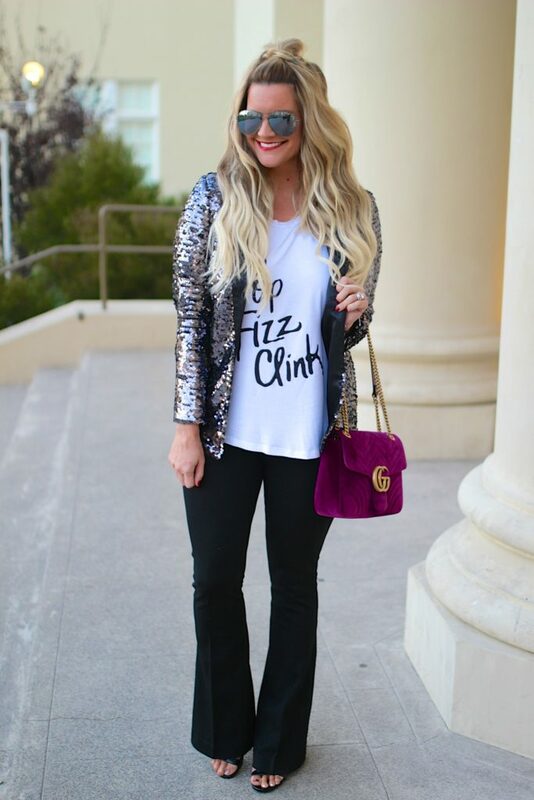 I love this sequin blazer! And so cute with that tee, too. Perfect for NYE! Crazy to think we are already talking about it! NYE of the past were a lot more lively HA! My goal is to make it to see the ball drop each year, but I typically fall asleep around 9 and set an alarm to wake up at midnight for it haha! Hope you guys have a wonderful weekend, Shauna! Let’s party and clink our glasses pretty girl! I LOVE that BLAZER! The sparkles are so fun but even if there were no sparkles, you’d still shine because you’re the brightest star in the room! Have a festive, shiny weekend sweet friend and cheers! So gorgeous! Love those pants, and your sequined jacket is so fabulous!! This is so festive for NYE, I looooove it! Give me all the sequins for the new year! This is seriously the cutest NYE outfit! I love that sequin jacket and your velvet bag. That tee is just darling! And your hair, I really love it here! I am not sure what we are doing yet, I need to start thinking about that!! How cuuuuute is that sequin blazer!! And I agree, I totally loved college/even high school NYE celebrations! Super cute look. Love the mix of casual & dressier. Pretty photos! Sparkle and Champagne, I’m in! Love this fun NYE look! What a gorgeous look to welcome the new year! Love the flashy sequined jacket, such a fun and festive piece! I was just looking at something sequin for NYE, then realized that we are staying in with friend, contemplated telling them, let’s dress up! But then I think…nah, let’s be comfy! hehe, Love the jacket! I love this jacket! All the sequins the better right now! So cute!! 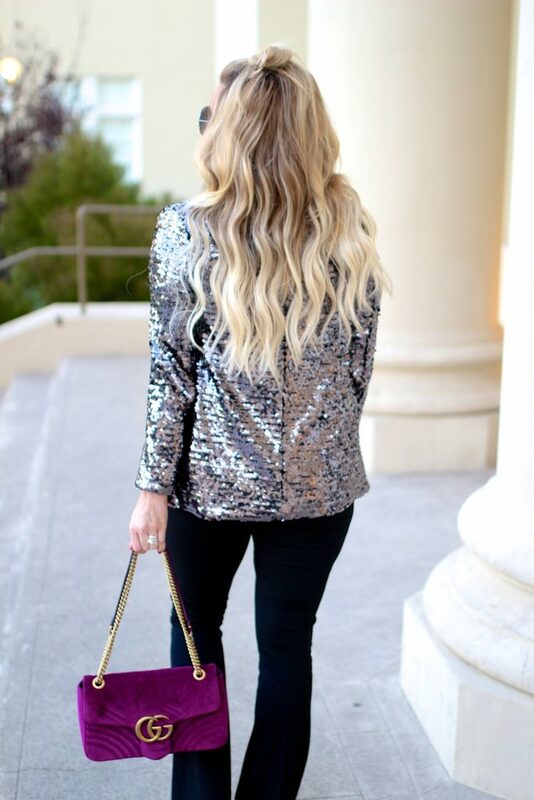 Love that sequin blazer! What a unique piece! 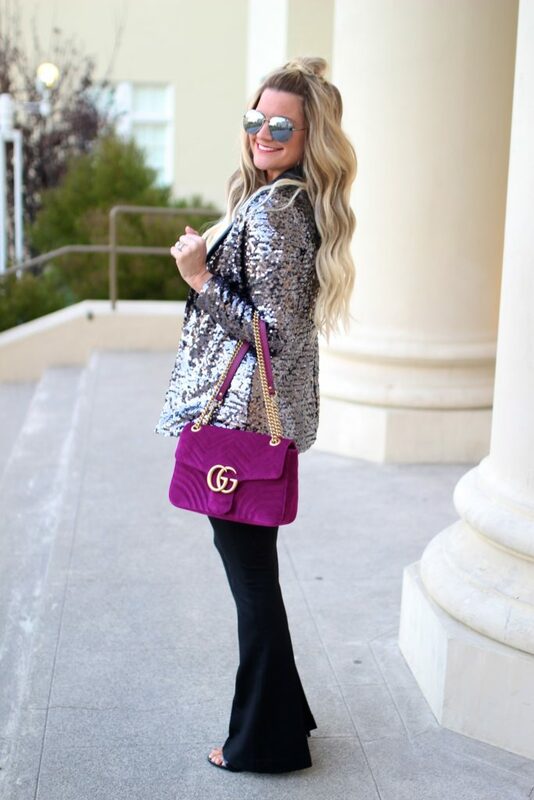 I just adore that sequin blazer! What a fun way to add a little holiday glitter to any outfit. I absolutely love this outfit! 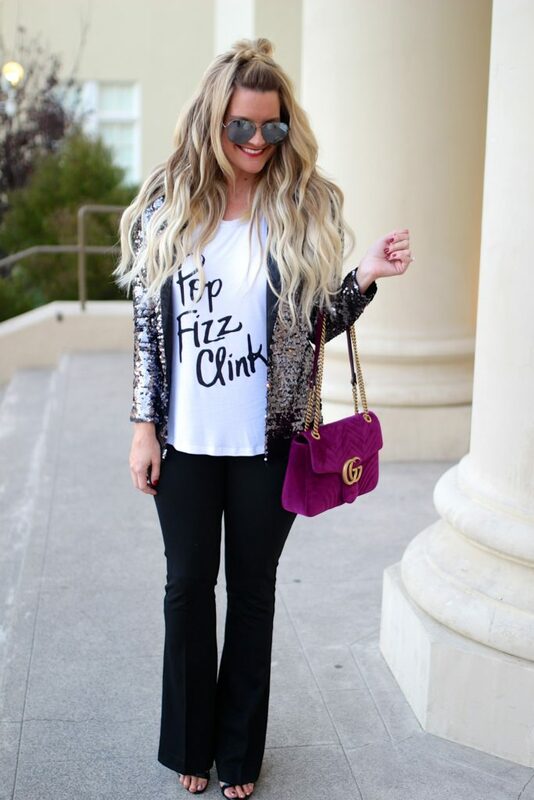 The sequinced jacket looks so nice paired with your black pants. Plus, your hair literally looks flawless. Cheers to the New Year! Dang it….those pants are sold out!! Those are so cute. Love this sassy pulled together look and the pop of color is perfect. Such a cute and stylish look. Shauna, you look adorable. 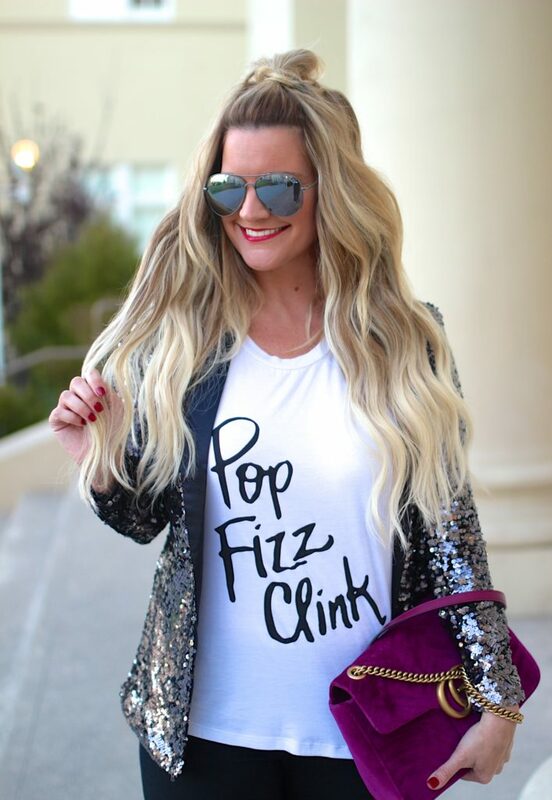 Love that sparkle and that fun tee! wow..! you look gorgeous.& stunning outfit girl…these pictures are fantastic. I love the jacket. Looks so great with the wide leg pants. 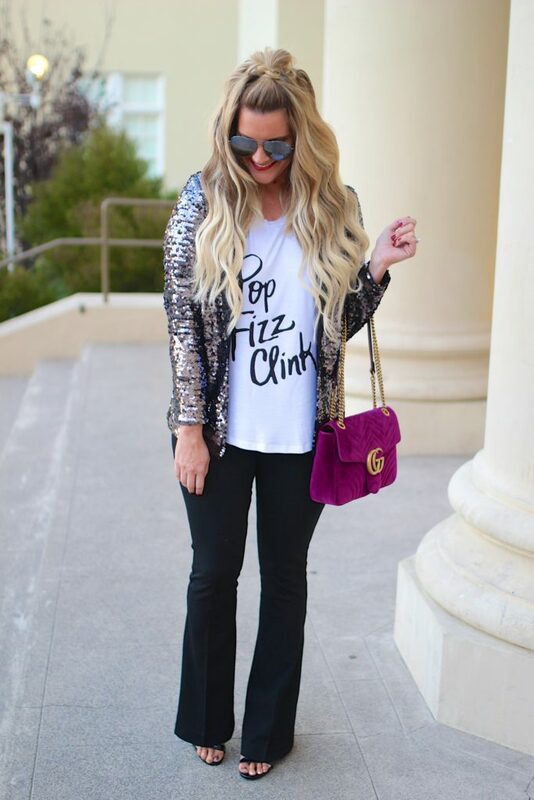 This is the cutest tee, and I love the sequin blazer! Such a perfect NYE look! Oh I love that blazer! What a fun piece, especially with the pop of colour from your bag 🙂 I wish NYE was a sequins wearing night for me – I rarely even stay up long enough to welcome in the new year now with two toddlers tiring me out, haha! Hope you are having a wonderful weekend and your Christmas preparation is going well. After a crazy week I managed to wrap some presents which is good, although (as always!) I’ve run out of tape! That bag is gorgeous! Love the sparkly blazer too!